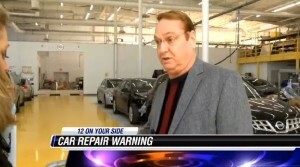 As large parts of the country dig out from snow, a Richmond, Va., body shop owner was featured on NBC12 warning viewers about aftermarket parts. Bruce Hutchins of the Bruce’s Super Body Shops chain highlighted Virginia’s “like kind and quality” law, which allows insurers to use aftermarket parts for claims. Hutchins said customers should know their rights, and NBC12 reporter Sarah Bloom cited his shop in urging viewers to advocate for themselves. This advocacy could be encouraged by a shop owner without a news crew as well: If you don’t think a part is truly up to the job, get the customer on your side and have them ask an insurer for a “like kind and quality” component to try and get an OEM or a higher-quality part from the aftermarket, recycled, or refurbished industries. “Obviously, they’re a lot cheaper than the OEM parts, but to say that they’re the same, in my situation, 99% of the time, they’re not,” Hutchins told the station. Hutchins also pointed out to NBC12 that an auto dealer could conceivably recognize aftermarket parts when you go to trade your car, truck, or SUV and offer you less for it. Similar issues were raised by the infamous “Anderson Cooper 360” investigation earlier this month. An insurer representative said aftermarket parts were limited to cosmetic ones and often just as good. “That’s not true,” reporter Drew Griffin reprimands on the piece.